Have you correctly entered the system in the universe.cfg? And the scripts done in the correct folder? StarBarycenter script in 'catalogs\stars' and the system script in 'catalogs\planets'? Looks like it, even gave them the names in your example. then I do not understand it, your system has always shown correctly for me. I have just discovered that your planet is a little hot. More than 800 Kelvin. [MT] Vendor: Creative Labs Inc.
[MT] Loading script "textures/common/CommonTex0973.pak/Modern Blue skin.cfg"
[MT] Loading star catalog "catalogs/stars/Stars120k.csv"
[MT] Loading star catalog "catalogs/stars/Stars.sc"
[MT] Loading star catalog "catalogs/stars/BinStars.sc"
[MT] Loading star catalog "catalogs/stars/ExoPlanetsSuns.sc"
[MT] Loading star catalog "catalogs/stars/Starwars.sc"
[MT] Loading star catalog "catalogs/stars/SullustBC.sc"
[MT] Creating subsystems of galaxy "Milky Way"
[MT] ERROR: InitPlanets(): Body "Rietta 1" have unknown parent object "Rietta"
[MT] ERROR: InitPlanets(): Body "Rietta 2" have unknown parent object "Rietta"
[MT] Loading script "textures/flares/Astroniki2 flares.cfg"
[MT] Loading script "textures/flares/Eden ghosts.cfg"
[MT] Creating planetary system of star "Sullust system"
[MT] Creating subsystems of galaxy "Star Wars galaxy"
[MT] Initializing planetary system of star "Sullust system"
Too close to the sun? Sullust is supposed to be an icelandic-style lava planet, according to Battlefront. Is there maybe a limit to how many new catalog planets Space Engine can support? If so that might mean Rocko's Star Wars planet's might have reached that limit. If anyone has any other ideas I'd be very thankful to hear them, because I'm at a total loss right now. Place the script in the 'catalogs\planets'. Since it is recent, SE would use it instead of the original. This may well be the reason. I've been lurking here for a year or more and occasionally playing around with building systems. In general I've been successful, but one thing continues to flummox me: system hierarchies. I seem to get things right with some systems (e.g. a binary pair of binary stars with planets orbiting each, sometimes even binary)... but here I can't quite figure out what I'm doing wrong. In practice, the attached .sc seems to produce the correct results in the engine -- but the heirarchy itself is all messed up. Hopefully the accompanying screen shot clarifies how. EDIT: oops Correct .sc attached. Thanks for pointing out my error @JackDole! Could anyone help me figure out what I'm doing wrong? I think you have attached the wrong file. It is simple, to make a ring with custom color, it should be a drawing file (.png for example) with a software that can transparency (Paint.net (free)) and that this file has as dimension 2 in height and 512 in width (512 x 2). That is at the time that the ring is lit and the lower at the time that there less lighting but not when it's all black. Then, with transparency (alpha), it determines whether or not it passes light, she is high, less light passing (at 255) there and instead, it lets all the light. Otherwise for the colors, the colors of your choice. 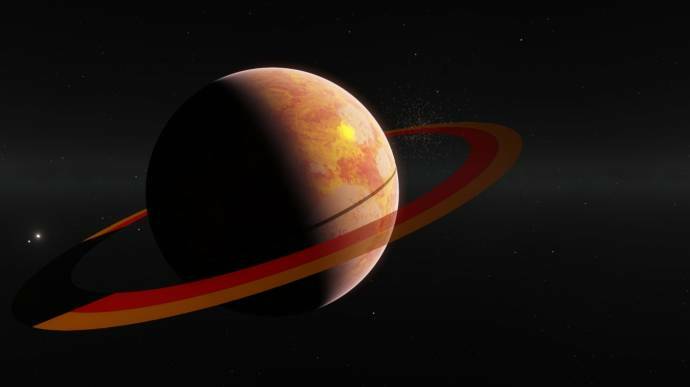 I put my ring custom below as an example (Selta on my mod Blackeshelsystem), the file and a screenshot in Space Engine. Is there a way or is developing that seaLevel works ? 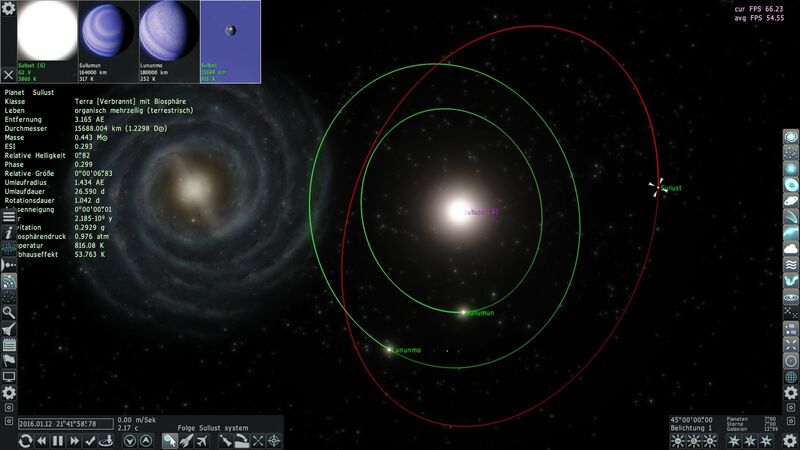 Because I have the height of the ocean, the maximum and minimum height, and the percentage that oceans cover the planet but it doesn't seem to be in agreement in Space Engine. seaLevel - relative depth of sea, obsolete parameter (use Ocean tag instead). 'seaLevel' has no valid function more. Yes I know but I wonder if one day, the setting will return for example imagine that you made a planet, you have 14 km maximum altitude and 7 km deep ocean but occupy 74% of the surface of the planet, I think there will be more land than sea, that's why I suggest that replaces it, it would be more convenient I think.